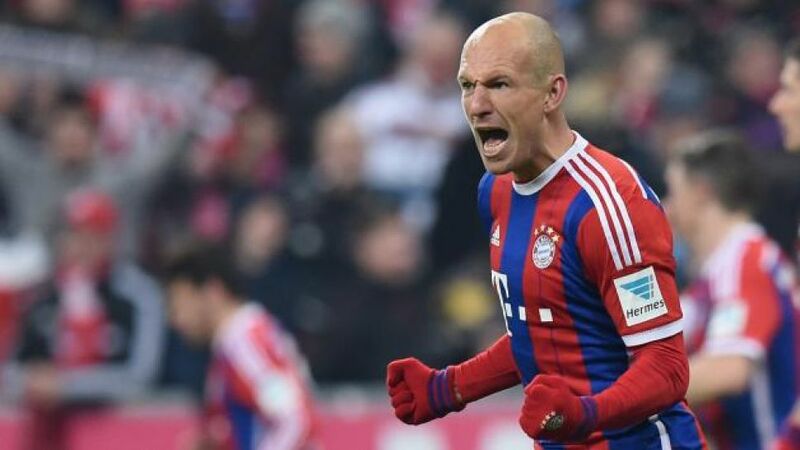 Munich - 'Not at all,' was Arjen Robben's bullish response when asked if there was any reason to panic given that he and his FC Bayern München team-mates are yet to pick up a Bundesliga win in 2015.
bundesliga.com: Arjen Robben, after the 1-1 draw with Schalke, you seemed a little bit frustrated. Was that the case? Arjen Robben: Yes and no. On the one hand, we can be pleased with the result given that we played with ten men for 75 minutes and that Wolfsburg couldn’t take advantage by drawing 1-1 with Eintracht Frankfurt. But on the other hand, I had the feeling that we really could have won, particularly because Schalke didn’t actually offer very much going forward. After we took the lead, we should have seen the game out. Schalke were very defensive and only really dangerous on the counter-attack or from set pieces, but unfortunately we didn’t take the three points. bundesliga.com: Do you think that one point from the first two games of the Rückrunde means it’s fair to talk about Bayern having had a poor start? Robben: No, I don’t think so, because we were much better against Schalke than against Wolfsburg. It’s always hard to play with ten men for 75 minutes, but in spite of that we controlled proceedings and tried everything. We even had a good few clear-cut chances, but unfortunately we didn’t get the reward. bundesliga.com: What was it like for you with coach Pep Guardiola constantly on the sidelines going up to his players? Robben: That’s just his way of being involved in the match. He lives each moment and is trying to help us all the time. Unfortunately, on this occasion it wasn’t enough. bundesliga.com: Do you think a win against Stuttgart on Matchday 20 is important in order to stop people talking about Bayern’s poor start? Robben: Of course it is, but we know that another tough test awaits us. The fact that Stuttgart are near the bottom of the league actually makes them more dangerous because they really need the points. Even if we’d won our first two games and were travelling to Stuttgart full of confidence, then it would be just as difficult. We'll get nothing for free. We’ll have to be switched on from the first minute and give it our all to get our first win of the year. Last season, it was really tough for us at the Mercedes-Benz Arena, so we’ve definitely been warned. bundesliga.com: So there’s no real reason to panic? Robben: Not at all. We took a real beating at Wolfsburg and were punished for our errors. We were culpable [for the defeat] and we've analysed the game in detail since. It was a good wake-up call. Our advantage over Wolfsburg is still eight points. I’m calm and optimistic about the next few weeks, even though we have to be critical of ourselves and stay focused. I’m convinced that we’ll give the right response out on the field against Stuttgart. Arjen Robben was speaking to Alexis Menuge.